Aurangzeb had decided to put an end to Sri Guru Gobind Singh Ji's and activities. 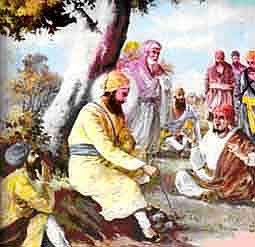 He ordered the viceroys of Sarhind and Lahore to march the Guru. They attacked Anandpur in 1701. All the hill-chiefs joined them with their armies. The Ranghars and Gujjars of the locality who were Muslims also joined the attackers. The Sikhs had to face overwhelming odds. They fought as they had never fought before, and held their ground against the repeated attacks of the Hindu and Muslim armies. 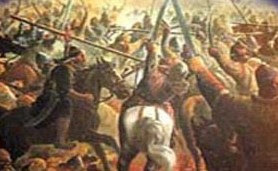 The Viceroys of Lahore and Sarhind were struck dumb on witnessing on the splendid spirit and bravery displayed by the Sikhs. They saw their soldier being killed in large numbers. After a time, they lost all hope of ever being able to defeat the Sikhs in open battles. 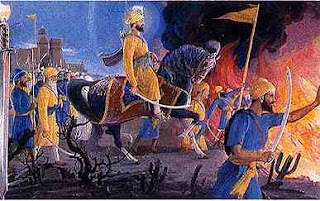 They decided to besiege the city, cut off all supplies and thus force the Sikhs to surrender or to die of hunger. They acted accordingly. After a time, the effects of the siege began to be felt in the fort. Those inside the fort began to feel pangs of hunger and thirst. Elephants and horses died lingering deaths for want of food. Now and then, the Sikhs fell upon the enemy's camp at night and took away some supplies and provisions from there. But such supplies could not last for long. The Sikhs bore the hardships of the siege with exemplary patience and fortitude for three long years. But then they began to lose heart. The messengers went to the Guru. They delivered the besiegers' message him. At the same time, they swore by the cow and the Quran that the besiegers were sincere in their offer. 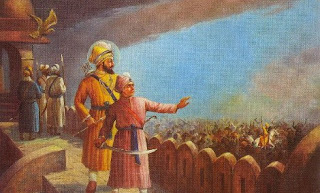 A number of Sikhs, however, were in favor of accepting the besiegers' offer. 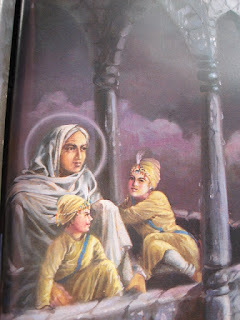 They went to the Guru's mother, Mata Gujjar Kaur Ji. They begged her to persuade him to accept the offer. She advised him accordingly. He tried to convince her that no reliance could be placed on the besiegers' oaths. But she was not convinced. Thereupon, he agreed to demonstrate the correctness of his opinion. They went away and soon returned to inform the Guru of trje besiegers' consent. The Guru told them that he would send out his property that night. The messengers went away. Under the Guru's orders such things as old shoes, torn clothes, horsedung, sweepings, and rubbish of all sorts were collected and packed in sacks. Thses sacks were to be the Guru's-'property' intended to be removed. They were covered with bright coloured cloth and loaded on the back of bullocks. Burning torches were tied to the bullocks' horns so that their departure and progress might be easily observed. Thus loaded, the bullocks were led out of the fort at the dead of night. As they approached the besiegers, the latter at once fell upon them to plunder the Guru's 'property'. When they found what the 'property' consisted of, they were filled with sorrow and shame. They had broken their solemn oaths and what had they attained! The letter was delivered to the Guru by a Qazi. The latter added that the hill-chiefs had sworn by the cow that they would not harm the Guru in any way. 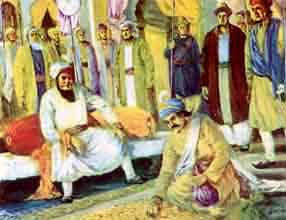 The Guru, thereupon, told the Qazi that he had no faith in the oaths and pledges of either the hill-men or the Turks. They were sure to be broken. A few hundred Sikhs wrote the 'disclaimer' and went away. After a time, the Guru's mother became in favour of going away with her daughter-in-law and grandsons. At last, the Guru yielded to his mother’s wishes. He agreed to evacuate the fort. Accordingly, he, his family, and his remaining left the fort at midnight. The night was dark and bitterly cold. A piercing cold wind began to blow. Soon it began to rain. 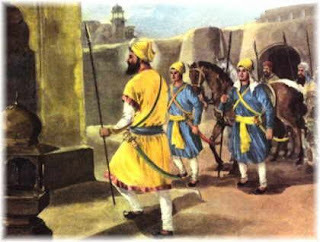 The besieging Hindu and Muslim armies learnt that the Guru and his Sikhs had evacuated the fort. They followed them, forgetting all their solemn oaths and pledges. They over­took the Guru and his party near the bank of the Sarsa stream. The night was dark. A bitter cold wind was blowing. The Sarsa was in flood. To cross it was very difficult indeed. 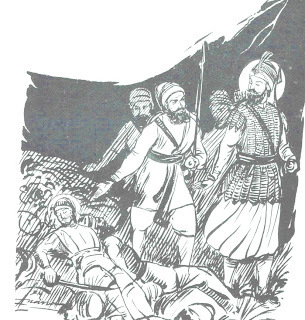 The Hindu and Muslim armies fell upon the Sikhs. There was hard fighting in the darkness and rain. In the confusion which ensued, all of the Guru's baggage, including some very precious manuscripts, was lost in the waves of the Sarsa. 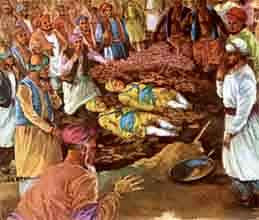 Many Sikhs were killed. The rest succeeded in crossing the flooded stream. The Guru was separated apart from his family. 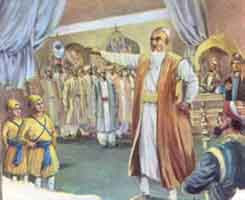 His two elder sons, Baba Ajit Singh and Baba Jujhar Singh, accompanied him. 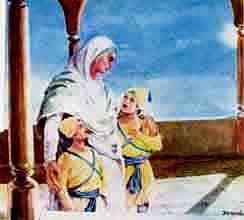 His mother and two younger sons, Baba Zorwar Singh and Baba Fateh Singh were separated from the main party. What happened to them will be related in the next chapter. The Guru, along with his two elder sons and forty Sikhs went to Chamkaur Sahib in the district of Ambala. His five dear Ones were among the said forty Sikhs. 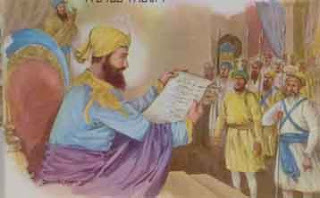 We have seen that when Sri Guru Gobind Singh Ji evacuated the fort of Anandpur Sahib the Hindu and Muslim besigers forgot their solemn oaths, and fell upon him near the Sarsa stream. 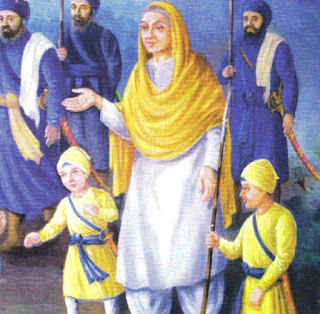 As said already, in the confusion which resulted from that attack, the Guru's mother, Mata Gujjar Kaur Ji, got separated from him and his Sikhs. His two younger sons. 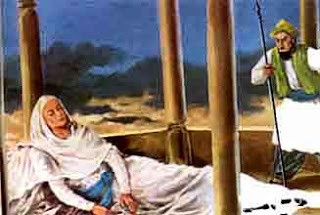 Baba Zorawar Singh and Baba Fateh Singh, were with her. In the biting winter wind of early dawn, she traveled as chance directed her. Her path lay through; thick jungle. Some way off, she met a Brahmin named Gangu. He had once been a cook at the Guru's house. His village Kheri was nearby. He offered to give her shelter in his house. She accepted his offer and went to his house along with her two grandsons. The Brahmin proved to be a cheat. At night he stole Mata Gujri's saddle bag containing valuables and money. Then she found the bag missing, she enquirered about it from her host. Thereupon he flew into a rage. He said that he had bee suspected and insulted. He at once went to the Muslim Headman of the village. The two went to the Muslim official of Morinda. 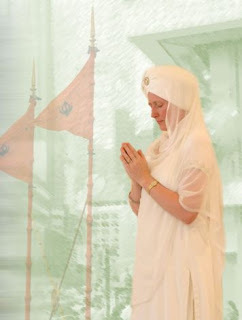 They reported to him about the Guru's mother and sons. He was glad to hear the news. Taking a party of armed soldiers with him, he went to the Brahmin's house. 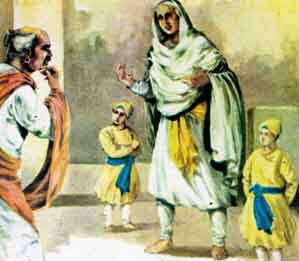 He arrested Mata Gujjar Kaur Ji and her grandsons, and took them to Nawab Wazir Khan, the Governor of Sarhind. All eyes were turned in their direction. Their slim bodies their calm bright faces, and their fearless appearance won the admiration of all present in the court, Sucha Nand, a Brahmin minister of the Nawab, advised the younger boy to bow before the Nawab. The blood of Dhan Dhan Sri Guru Arjan Dev Ji, Dhan Dhan Sri Guru Har Gobind Singh Ji, Dhan Dhan Sri Guru Tegh Bahadur Ji, and Dhan Dhan Sri Guru Gobind Singh Ji runs in our veins. Then he ordered them to be taken back to the tower. Next day, they were taken again to the Nawab's court under a heavy guard. Before they left, their grandmother again exhorted them to adhere to their faith, come what might. In the court the same threats were given and the same offers were made as on the previous day. They stood firm and gave the same answers as on the previous day. Sucha Nand Brahmin again pressed the Nawab to give immediate orders for their death. But the-latter again decided to give them more time to think over. He still had hopes that they would yield. So they were again taken back to the tower. Next day, they were again taken to the Nawab's court. There the same offer was made by the Nawab and rejected by them. When the Nawab was convinced that they would not yield, he gave orders that they should be bricked alive and then beheaded. On hearing this, the Qazis and other mean people like Sucha Nand Brahmin said aloud, 'That is as it should be.' But most of those present in the court set with their heads bent low, and their eyes wet and fixed on the ground. The Sikhs have always remembered this protest of the Nawab with gratitude, and throughout their troubled relations with the Muslim powers, they have always spared the house of Malerkotla front their attacks. The Nawab was rendered speechless. He turned to left and right, seeking someone willing to do the bloody act. But all hung down their heads as a sign of their unwillingness, as a sign of their pity for the children. At last, looking behind, he saw two Ghilzai Pathans. The Ghilzai tribe was notorious for its heartlessness and cruelty. These two Pathans offered to do the bloody deed. The boys were delivered to them. They led them away for execution. After each layer of the bricks, the Qazi urged the two to save their lives by accepting Islam. But they stood calm and firm. They were busy in reciting sacred hymns of the Gurus. When they were buried in the wall up to the shoulders, the Nawab himself came and said to them in an affectionate tone, "There is still time for you to save your' lives, just recite the Kalma and the wall will be pulled down immediately." "We shall not give up our faith, death does not frighten us." "Blessed be their mother who gave birth to such children, and Blessed it the mother who taught them to give up their head, and not their Faith." "They are putting us to test. 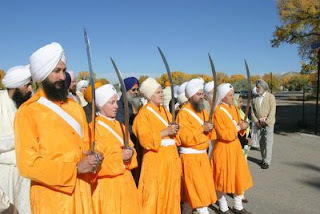 They do not know that the Sikhs of Sri Guru Nanak are fearless. 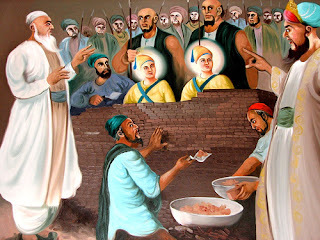 Our Fifth Guru Arjan Dev faced martyrdom cheerfully on burning iron pans. Whereas he guided humanity to the path of a truthful and noble life, he also set an example of facing death boldly and with full faith in God." "The martyrdom of our revered grand father, Guru Teg Bahadur Ji was also unique We shall soon join him. He is waiting for us." Later both the Sahibzadas became unconscious. The executioners became nervous and consulted each other. They are now nearing their end. There is no need to raise the wall further. Why not cut short by beheading them? It is already getting dark. The wall was pulled down. They brought the unconscious Sahibzadays out laid them flat on the ground and, in an instant, martyred them. People in the crowd were shocked at this ghastly act. They sighed in dismay, "What cruelty! How shall they answer for their crime in Mohammad's Court." Soon she was gone to meet her grandsons. Todar Mai touched her feet and sobbed in anguish. Todar Mai chose the site. He spread out gold coins to cover the whole piece of land that he required. 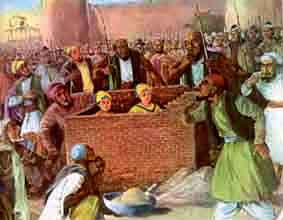 He took out the two martyrs' bodies from the wall. He took out Mata Gujri's body from the tower. He took the three bodies to the site selected and purchased by him. He cremated them and later buried their ashes there. 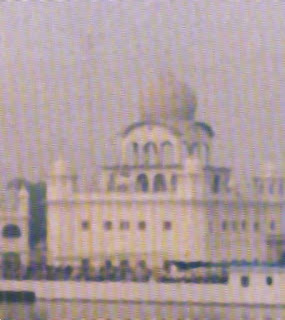 On the spot where the three bodies were cremated was later erected a gurdwara named Joti Sarup. At the place where the two children were bricked alive and beheaded, stands the gurdwara called Fatehgarh Sahib. Nearby, at the site of the tower in which the three were kept imprisoned, and where Mata Gujri breathed her last, stands a gurdwara called Mata Gujri's Burj. The article does an amazing job in discussing the issues surrounding around women rights and freedoms in Sikhi. Gurumustuk Singh (aka MrSikhnet) is a great writer, and this is reflected in the article. It highlights the challenges we still face today. Nevertheless, the Western-Sikhs are becoming the foundations in overcoming these issues that are still prominent in the Punjabi Culture. I’m pretty sure many young Sikh women thank Gurumustuk Singh for highlighting some of the issues we face. Thus, I request that we all respect the beliefs and personal stories that he has provided in this article. I always feel a little awkward when I hear Sikhs boasting things like, "In Sikhism there is Gender Equality. 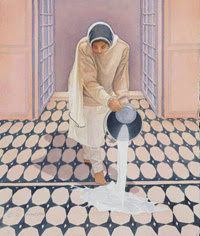 Women can do everything than men can". Of course this is the ideal and the teachings of our Guru’s, however in reality and practice we have much to overcome to truly establish this so called "Gender Equality". In India especially it is quite common for women to be treated badly and not given the value and leadership roles that are deserved. It makes me think of Bollywood movies where the husband is this overbearing man who is the "God" of the house. Whatever he says is law and MUST be obeyed, or else she is beaten or scolded in some way. In these situations it seems the sole purpose of the woman is to take care of the man and the kids and do as the husband says. "...In general I think of a women being loving and coming from the heart, and men being egotistical and coming from the head. I can understand the relationship of a woman serving her husband and contributing to the household, but much of the time it doesn’t come across to me as an equal partnership..."
Another major indication of this is the HUGE problem of infanticide in Punjab, where girls are not valued. The babies are aborted just because they are girls. The ratio of men and women in Punjab is so out of balance that it makes me wonder where all these men will find a wife in the future? A less extreme example would be how the child/boy of the family is treated extra good and can do many more things than the girls. I’m sure other women could share more examples like this relating to being in a family with other brothers and how they are treated in and unfair way because they are a girl. Then there are the issues of physical and sexual abuse by other dominant men. Much of this is kept secret if discovered by families. I have also heard from other Sikh women’s groups about how many families take the side of the man and don’t give the support that the woman needs to deal with these issues. Just imagine that you are being raped or beaten and get no support from your family?? Again the women becomes the victim without support, from her OWN family. I can only guess how widespread these issues are. 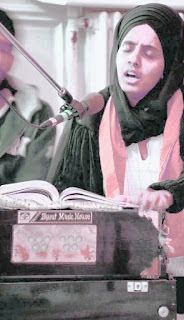 It baffles me how a religion that has a core belief of Gender equality can justify not allowing Sikh woman to play Gurbani Kirtan in Harimandir Sahib or certain sevas which are "reserved" for only men. Ok…if this were some small random Gurdwara somewhere one might just write it off as a small thing. However when this is the case at THE Harimandir Sahib which is one of the most visible and visited place of worship for Sikhs, you would think that people would do what is right. "...the 'Panj Piaray' is any 5 Sikhs of the Guru, not any 5 men of the Guru..."
This is such a clear indication of how deep the issue of gender inequality is in the Sikh communities and how we rationalize things to suit ourselves and our own understanding. When I last went with my family to Harmandir Sahib in Amritsar, after Asa Di Var they were giving the "panj piaray" prashad, and I held my cupped hands up to receive it. The sevadar gave me parshad. My wife who was right next to me innocently had her hands raised and cupped ready to receive the Guru’s prashad, but the sevadhar would not give it to her because she was a woman. I then took half of my parshad and gave to her. The sevadhar and another person then tried to scold me that I couldn’t do that. I wrote a whole blog post on the topic of women and the panj piaray if you are interested in reading more. 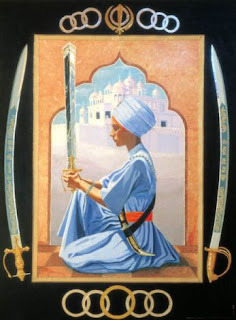 The Kirpan - Protecting Those in Need I think many of these things are negative cultural issues which will change over time, but I feel that as Sikhs of the Guru it is our duty to stand up in support for our sisters, daughters, aunties and friends. We should not just stand by and allow these things to continue. The kirpan is there to remind us to stand up against injustice, and to protect those in need. If we cannot do this for the women in our own family/community, how can we do it elsewhere? What can you do to help? To start I think to we can all make a difference by first looking at the actions of ourselves, family and circle of friends. There may be negative things that you or others do without even thinking about it. The first step to change is awareness of the problem. In your daily life be aware of these issues and stand up for women when something is being done that is not right. The things could be small, but they are just as important. Let us honor, respect and truly include our Khalsa sisters as Sri Guru Gobind Singh Ji would have, and stop these practices. Please remeber to respect the beliefs and personal stories shared in this article before you comment on this topic. Two Amrtidhari Singhnees, Bibi Amandeep Kaur and Ravinder Kaur, who fought off a would be robber, being honored at Gurdwara Singh Sabha Guru Nanak Nagar by Kapurthala citizens for thier bravery.